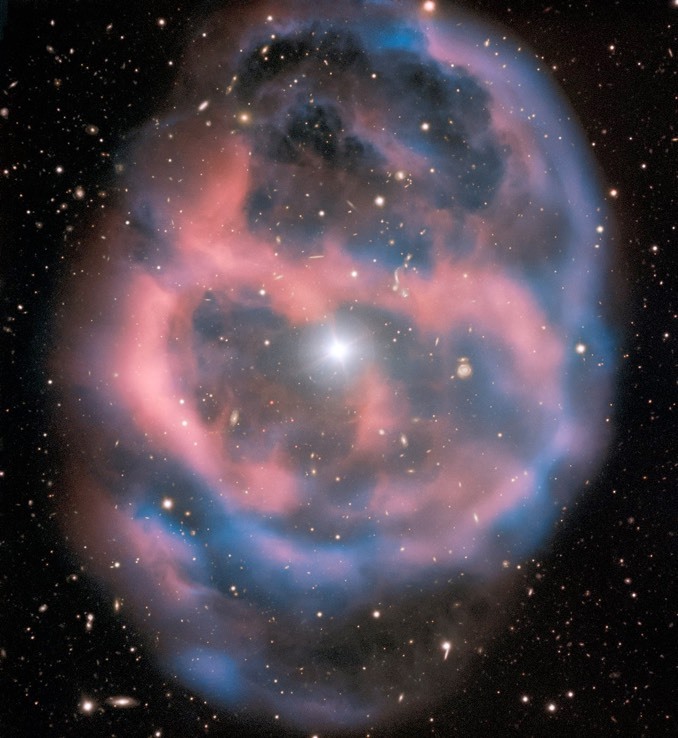 The European Southern Observatory’s Very Large Telescope captured this captivating view of a planetary nebula known as ESO 577-24 some 1,400 light years away, showing the ephemeral glow of ionised gas expanding in billowing clouds around the blazing husk of a once mighty red giant in the process of becoming a slowly cooling dwarf. After running out of nuclear fuel, the star’s core collapsed, temperatures and pressures climbed to extreme levels and heavier elements began burning in an astronomically brief spasm. The star’s outer layers were blown away into space and ionised by ultraviolet radiation from the fast-burning core, producing the colourful scene captured by the VLT’s versatile FORS2 instrument. The clouds seen here typically last about 10,000 years before thinning out, dimming and disappearing from view. This image, captured as part of ESO’s Cosmic Gems public outreach program, also shows the faint trail of an asteroid to lower left of the central star and numerous, much more distant background galaxies.